Ha! I just got it. … Um… yeah. Grenades do that. It isn’t a flash bomb. It is a PAF device, silly. You might even say she blinded him with science. Also, I spy a typo! :3 (in the alt text, not the comic) We forgive you. Oh, I’d say her actions have definitely peaked louder than his words. Chuckin’ a flashbulb at someone using see-in-the-darks is off the scale. Better to point out the tiny little insignificant details than giant gaping holes. THIS IS WHAT YOU GET FOR MONOLOGING. You don’t talk, then shoot! You shoot, then shoot again. When you’re /completely sure/ they’re dead, then feel free to gloat! No. Not even then. *Especially* not then. See, that’s when the get you. It’s a trick. Get an axe. Ironically, all of the other pirates knew his paf-ological arrogance would be his downfall. Oh cool, a flash-bang grenade. Oh common, he’s just pulled an arrow outa his shoulder. That’s no way to do a proper Sciencing. ARGH ze irony, it burnz my eyez. Also the magnesium powder (?) bomb. Been a while since I posted on this, even though I should have. D: I’m getting lazy. Have I said, lately, that your work is exemplary, you guys? I like how you’ve done the lighting, the rhymes… Just about everything. Are you angels? Sent to guide us? Alas a finely curled moustache cannot hold a candle to the revealing light of science. 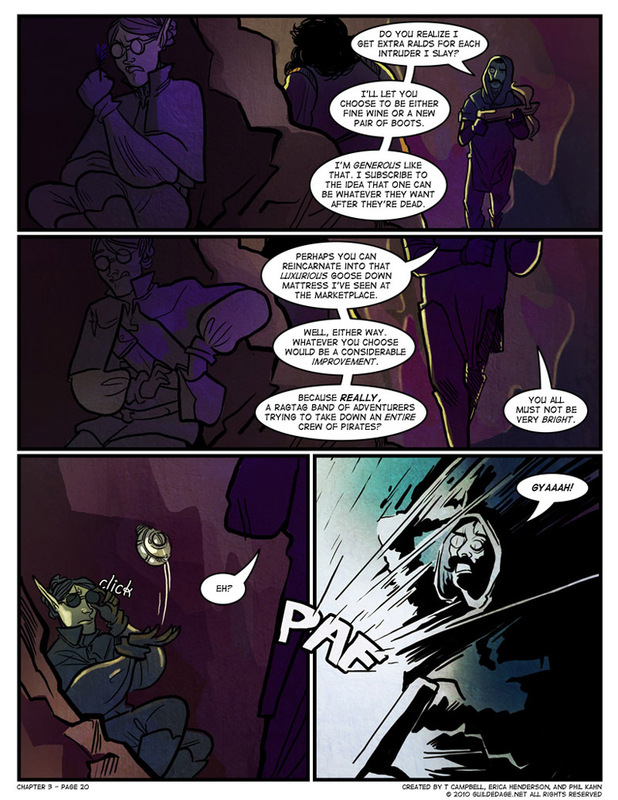 My favorite bit is Syr’nj’s tongue in panel 2. It shows control and cool-headedness. Panicked folks don’t have the presence of mind to stick their tongue out thoughtfully. See? Goggles/sunglasses can be useful! This shows that when a bragging sniper is tracking you down the thing to do is throw a grenade in his face. It would have been better as a shrapnel grenade that would stab out his eyes and rip up his face with a thousand tiny pieces of heated, speeding metal. It might wake our berserker up though. Fingers crossed guys! Also, the sniper reminds me a little bit of Byron’s mouthing. And if I chose.. I would not be the mattress.. I would want to be something useless like fine wine that gives one a hangover. I”m the vengeful dead. Rantting. It’s a -1 cndition in any situation. If you’re dealing with heroes, adventurers, [charname]s and/or main characters it is a Dying Horribly condition. Good sir, Spectacles are superior to Monacles! Please allow me to enLIGHTen you! If I weren’t such an inveterate punster myself, I think this chapters comments would have been enough to turn me off of reading them. There were some ba-ad ones in there. Keep up the good work, and meet me later at Callahan’s cross-time bar, with Justin, the Mick o’ time. Why do they always talk so much? Just yammer on AFTER you’ve killed them. I’d pick the boots. Somehow, being on some guy’s feet seems so much better than the options of going through the digestion system, or the implications of being a mattress, if you get my gist. that’s right, do SCIENCE to him! I would suggest spending it on fast acting poison, perhaps paralysis, for your arrows.